We do not employ guides or unqualified “ride captains”. All our team members are formally certified as cycling coaches. They are also highly experienced competitors. 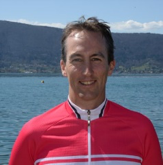 Silas was an international triathlete; Olivier has won several sportives in France; Yannick was a successful Elite rider on the verge of turning professional, Stéphane competed at the highest amateur levels. Equally important, they are all lovely people who like nothing better than to share their knowledge and help other people reach the next level. If you join one of our camps, you will get to know them very well after a week of cycling and sharing drinks, meals and laughter together! Click on the photos below to learn more about each person. 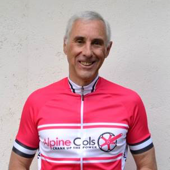 Alpine Cols is a French company, registration number 799 370 291, established in December 2013. The company is approved by the Tourist Authority Atout France under the registration number IM001140003. Professional liability insurance is provided by Hiscox Europe Underwriting Limited – Hiscox France, 19, rue Louis Le Grand – 75002 Paris, under the policy no. RCP0236479. Your payments are fully guaranteed by International Passenger Protection Limited, registered in England under the number 2498563. My wife Emmanuelle and I moved to the mountains with our family in 2003. Since then I have cycled tens of thousands of kilometres in the Alps, thoroughly neglecting the house and garden… Surrounded by so many beautiful mountains, who can resist the challenge of cycling up them? 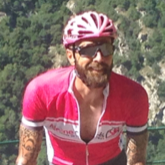 Creating Alpine Cols was a natural choice to share my love of France and the famous Alpine climbs with other cyclists. I’m a (somewhat lapsed) engineer by trade, which comes in handy for fixing bicycles and mastering the intricacies of power meters. I am qualified as a British Cycling Level 3 coach. Competitive by nature, I have cycled in dozens of Alpine sportives, including 8 Haute Route (March 2019, with 3 more to come this year). Changing age category in 2019 will perhaps give me the chance to stand on the podium for the first time! When not busy with Alpine Cols, I coach senior management on effective leadership behaviours. Together with my partners in the Enablers Network I lead motivational workshops, team-building and employee engagement seminars. My business presentation What Can Cyclists Teach You About How To Motivate Your People? Climbing or descending? It is hard to choose! As a teenager in France I swam at national level and still enjoy swimming. I did try to get Marvin to join me doing laps in the pool but he was never very keen. I, on the other hand, have now joined him on the bike. Just as well… I would not see much of him otherwise! Road cycling makes me feel young again as each climb is a fresh challenge. I love cycling up the long climbs: get in a rhythm, start day dreaming and above all savor this time away from daily constraints. Descending is all about technique: mastering a high-speed descent is a great feeling! Cyclosportives are even more fun as they give the opportunity to meet other cyclists – from all over the world at the Haute Route or the Etape du Tour. Winning my category at the Haute Route and taking only 5h15 minutes to do the 180 kms around Lake Geneva have been great highs. When not with Alpine Cols guests, I am either pelting round the velodrome in Geneva or at the Hotel School of Lausanne, where I teach how to manage legal risk in the hospitality industry. After a university degree in the sciences I decided to follow my heart and not my head. For the past 15 years I have made my living in cycling by coaching and writing articles for the press. 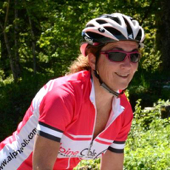 I have covered over 100,000 km as a coach to groups of cyclists. All this experience helps me to identify the needs of cyclists of all levels very quickly and to coach them accordingly. My passion for the mountains means I’ve been riding in cyclosportives for the past twenty years. I usually participate in between 5 and 15 per year. My favourite is the Marmotte, probably the toughest with its 5000 m climb in 175 km. I have been in the first 20 seven times in 12 attempts. My greatest joy is sharing my passion with like-minded people, helping them progress and appreciate our wonderful sport. I like nothing better than taking people behind the scenes at the Tour de France to share in the magic of this extraordinary race, which gives so much pleasure to so many millions around the world every summer. I have always had a huge passion for all endurance sports, starting with swimming as a kid. I then progressed to triathlon, eventually competing for New Zealand 1998, before discovering the world of bike racing and the fun of competing in one day events and stage races. I graduated with a degree in Sports Science in 2000 and began work as a full time coach. Over the last 15 years I have been fortunate to coach many Elite and Age Group national champions and both professional as well as amateur athletes. I now live in the French Alps close to Annecy, one of the best places in the world for cycling in the mountains. From here I keep in extremely close contact with all my athletes. I design totally customised training plans for each person, taking into consideration every aspect of preparing physically and mentally for events. My ultimate goal is to help each athlete achieve amazing, life changing experiences in their chosen endurance events! The mountains are my life! Born in Albertville in the heart of the Alps, I found it hard to focus on my school work and spent my days dreaming about skiing and cycling in the mountains. It was no surprise then when I passed my professional qualifications as a ski instructor and a cycling coach. I must have cycled multiple times up every possible climb in the Northern Alps, including many that don’t figure in the guidebooks! Apart from six years spent in the paddock on the Formula One circuit with Toyota, I have stayed in the mountains ever since. 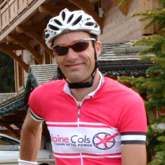 During the winter I teach private clients on the ski-slopes in Courchevel, and in the summer I cycle. It is a great life, living out my two passions and sharing them with like-minded people: I like nothing better than to pass on my experience. 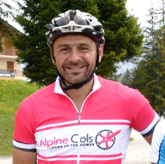 I compete in many of the Alpine cyclosportives, such as the Time Megève Mont Blanc the Marmotte and of course the Haute Route! Cycling is in my blood. I go everywhere with my bike, it keeps me calm and helps me face the world. This is more than my sport, it is my life. I am passionate about the Tour de France. To go higher, faster, further, break through the barriers, do as the champions. This is the force that leads me again and again to the most beautiful roads in the world, the roads of the Tour de France, the force that makes me climb the greatest mountains, the force that has taken me to the highest levels of amateur cycling. Another passion: meeting new people. Experiencing unforgettable moments, using my experience to help others to reach their dreams. Sharing stories and knowledge of the world, trading expertise, fellowship on the same road. This is my métier and my dream, and why I qualified as a cycling coach.